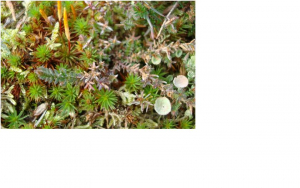 Moss mixed with Cladonia spp. lichen on a south facing Dorset Dry Heath, Habitat classification 4030. In between heather palnts, Calluna vulgaris. Soil; sandy/grit and acidic, little topsoil<50mm. Sporophytes orange/ brown and tapered oval. Is the Cup Lichen Cladonia fimbriata?